If you are a camper or a traveler, you know how important it is to ensure that your drinking water is safe. Getting sick from contaminated water can ruin your trip! There are many systems that are available for purifying water, including boiling the water (which is what we all used to do), using various types of filters, and adding iodine tablets to kill harmful bacteria. While all those systems work well, they also have some drawbacks. Filters can be heavy, boiling water takes extra time and fuel, and iodine tablets leave water with a strange chemical taste. The SteriPen Water Purifier is a very effective way to treat your drinking water, and it is small and light-weight -- perfect for taking along on any trip. 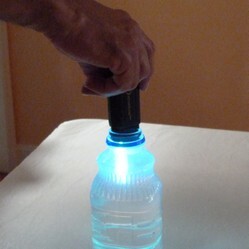 It works quickly by using ultraviolet light to kill "bugs" in the water. My husband enjoys going on long backpacking trips each summer for up to two weeks at a time. Since he prefers to carry as little weight as possible, he has researched the best light-weight gear for his needs. One necessary item is a water-purifying system. For my husband's most recent hike, a 12-day journey along part of the Pacific Crest Trail in Oregon, he brought along the high-tech, light-weight SteriPen Adventurer Opti Water Purifier, shown below. At 3.6 ounces it's much lighter than the water filter he used to carry with him on previous trips (which was about a pound -- and the pounds add up). How Does the SteriPen Water Purifier Work? The light-weight, portable SteriPen works by using UV (ultraviolet) light to kill over 99.9% of bacteria, viruses, and protozoa in the water. This includes giardia, e-coli, legionella (Legionnaire’s Disease), and salmonella, among with many other bugs that can make you sick. Besides being great for backpacking, it is also good in emergency conditions. If your local water supply is contaminated and your municipality issues a boil-water order (advising that people boil their water for one full minute before drinking), you can make your drinking water safe without boiling by using one of the SteriPen models. Or if you travel to other countries, this is the perfect traveling companion to keep you safe from "Montezuma's Revenge". I could have used this when I was in India. Yes, I did get sick once from the water, and it wasn't pleasant. If your water contains particulate material, you would pre-filter it first. You can buy a SteriPen pre-filter (shown toward the bottom of this page), or keep it simple and just use a coffee filter, or as my husband did, a bandana. It’s fine if the bandana is dirty by the way, because the SteriPen Adventurer will purify the water that goes through the bandana. It takes about 90 seconds to purify a liter of water. Watch the video below to see a good demonstration of how simply this innovative device works. Even though the different SteriPen models get great customer reviews overall, occasionally one will be defective. TEST this device far enough in advance of your trip to make sure it works and to make sure you know how to use it. Discovering that it's defective (unlikely), or that you don't understand how to use it when you're out in the field (more likely if you don't follow the instructions) would be very frustrating. Watch the video above to get a good overview of the instructions. You will need a wide-mouth drinking bottle for the SteriPen to work. My husband went "cheap and light" and just bought a couple of liter-sized Gatorades, dumped the Gatorade, and used the bottles for his trip. They worked great! You can also buy the heavier-duty Nalgene bottles that many backpackers use. And to be on the safe side, in the unlikely event that this device fails while you're out on your trip, my husband recommends that you bring along iodine tablets for emergency water purification. They're inexpensive and light. They take longer to purify water than the SteriPen (30 minutes vs. 90 seconds), and they give the water a funny taste, but in an emergency they'll work just fine. Or you could boil the water, but that also takes time and extra fuel. 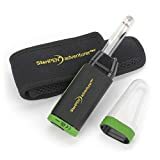 My husband had no problems whatsoever with his SteriPen Adventurer Opti on his 12 day trip, and feels he has the perfect water purifier for his needs. He strongly recommends it to any other backpackers or travelers who are looking for a light-weight solution for purifying drinking water. The SteriPen Water Bottle Pre-Filter removes particulates from the water and fits over the openings of wide-mouth water bottles. Or you can use coffee filters or a bandana to filter your water if necessary. The iodine tablets, below, are a good back-up plan just with the slight chance your SteriPen water purifier doesn't work. They're light and effective, although they take longer to work than the SteriPen, and the water will taste like iodine. I don't recommend using them as your sole method of ensuring safe drinking water, but they are good for emergency use. Do You Use a Water Purifying System When You Travel or Go Camping? What have you used? What has worked best for you? Have you tried the SteriPen before, or something like it? How has that worked for you?